You don't often see attempts to bridge the gap between milsim paintball and airsoft. But for a year or so now, GameFace has been marketing a product that attempts to do just that by creating a bb pellet with marking capability. 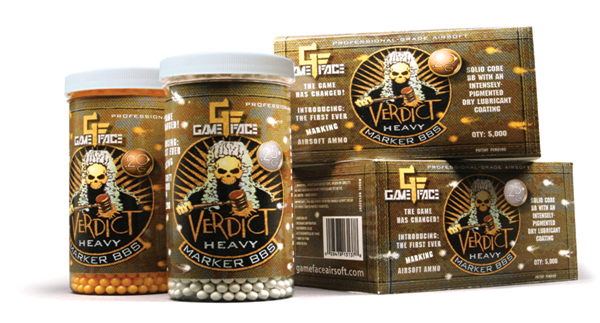 Verdict Marker BBs are covered with a dry powder, that transfers to the target upon impact. While I can see how this eliminates the need for a complete honour system (which airsoft typically relies on with mixed results), the size of the mark left by the BBs is rather underwhelming. It also begs the question, if you want to participate in a milsim activity, but don't want to rely on the honour system airsoft puts in place, why aren't you playing paintball? But maybe these really are more effective than I give them credit for. Has anyone ever used these pellets? What kind of feedback do you have for them? I have, they are quite reliable as long as you use a gas pistol or a high powered AEG(my case at least, my friends used run of the mill AEG and all I had on my was bounces.I switched to paintball completely because I already played it and I didn't have to worry about this things anymore. I like the idea, as long as it cleans easily. 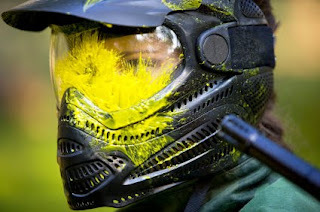 That's the appeal of airsoft to me, easy of cleaning vs paintball, and the guy in the picture is hit at least 36 times, so hard to deny it, and I don't think they'd have the splatter issue that we have in paintball, I can come out of cover looking like I've had a can of paint dumped on me, and it's all just spray. The honour system for paintball is sorely lacking in Southeren Ontario. If it wasn't for the great reffing at Flagswipe on DDay, I saw alll kinds of blind fire, wiping etc. One guy was gogged 3 seperate times and wiped and kept going untill a ref literaly dragged him off. I'd like to know how easy it would be to clean this stuff off, as from what I've heard the marking BBs tend to stain like an ink. 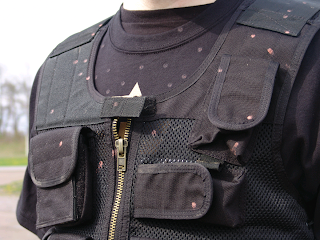 Also, what would be the mechanical consequences of running powder-covered balls through your airsoft gun? I've wondered the same thing Mike. If they only work in high end airsoft, and they have the potential for gunking up gears etc., you have a bit of a dilemma on your hands. They do stain a lot, at least they did when I weas playing Airsoft. Then again Older paint used to satin a lot back when I started playing paintball so, the smart thing to do would be test them.